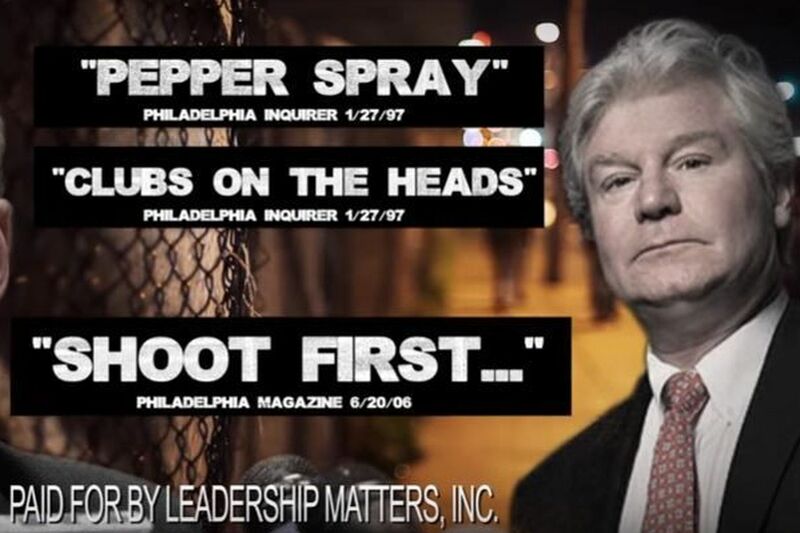 Leadership Matters Inc. aired this ad one time before the May 2015 Democratic primary for mayor, accusing then-candidate Jim Kenney and John Dougherty (pictured) of being in favor of police brutality. That attack ad popped up briefly during the 2015 Democratic primary for mayor in Philadelphia. It was aired just once on television and then was brushed aside in the bustle of a busy election. But John Dougherty, leader of Local 98 of the International Brotherhood of Electrical Workers, didn’t forget. And he was sure that a rival union, the Teamsters, was to blame for the ad suggesting he and Jim Kenney, then a candidate for mayor, supported police brutality. Dougherty vowed revenge, telling Local 98 president Brian Burrows he would have City Councilman Bobby Henon “start to put a tax on soda again, and that will cost the Teamsters 100 jobs in Philly,” according to a 116-count federal indictment filed last week against Dougherty, Henon, Burrows and five other Local 98 officials. Except it wasn’t the Teamsters. It was another Local 98 rival, the Philadelphia-based Carpenters union, that financed the commercial. That little drop of political spending — the ad registered at just $93,000 in 2015 campaign finance reports that showed more than $11 million in “independent expenditures” by four other groups — sent out ripples spreading to Kenney’s bid for reelection this year and into the free-for-all City Council campaign season. Kenney’s signature achievement — a 1.5-cent-per-ounce tax on sweetened beverages to fund pre-K education, community schools, parks, recreation centers, and libraries — is expected to be the hot topic in local elections. The mayor insists the tax wasn’t proposed to him by Local 98 as a way to seek revenge against the Teamsters. The television commercial was paid for by Leadership Matters Inc., a nonprofit that registered in Pennsylvania a week before the ad aired, just before the May 2015 primary. Dougherty may have assumed the ad was paid for by the Teamsters because they, like the Carpenters, were supporting State Sen. Anthony Williams in the mayoral primary. Last week’s indictment calls it “a political commercial sponsored by the Teamsters Union.” Two sources with knowledge about the ad said the funding really came from the Carpenters. Henon, who returned to City Council chambers Thursday morning, declined to say if he pushed for the soda tax to punish the Teamsters. “I’ve done nothing wrong, and I will not speak to the indictment,” he said. Pa. Gov. Tom Wolf (left) and Lt. Gov. John Fetterman. When Gov. Tom Wolf and his second-in-command, John Fetterman, announced plans to poll Pennsylvania residents about legalizing marijuana for recreational use, we just had to ask. Had Wolf and/or Fetterman ever smoked a joint or otherwise indulged in the wacky tabacky? The responses, provided by their offices, perfectly match their strikingly different personalities. And our new lieutenant governor, who looks and sounds like a professional wrestler, albeit one with a master’s from the Kennedy School of Government at Harvard? We’re told Fetterman sparked up at Burning Man, a sort of post-apocalyptic Woodstock in the Nevada desert. Fetterman’s first stop on his 67-county listening tour is Monday at the Jewish Federation of Greater Harrisburg. Must be a hotbed of stoners, right? But before he hits the road, the governor’s campaign sent out a “one-question survey” asking people whether they support marijuana legalization. Answer, and Wolf’s survey will ask another: Do you want to donate some money? Just how Republican do you have to be to be the party’s nominee for mayor in Philadelphia? Philadelphia’s Republican City Committee has some decisions to make when ward leaders gather Wednesday. Should they endorse someone for mayor or let potential candidates slug it out in an open primary? And, if they endorse, exactly how long does a candidate have to be a Republican to qualify? Three prospects — Billy Ciancaglini, Daphne Goggins, and Robert Hunter II — made pitches this week in a ward leader meeting. Ciancaglini, who declared his candidacy in December, acknowledged that he has previously run for judge as a Democrat. He switched parties last year. Goggins, who entered the race last week, noted she has been a Republican all her adult life. She said recent party converts lack the credibility of longtime members, and she complained about past candidates with no real Republican connections. Hunter, a Republican since 2016, told ward leaders he had volunteered on recent campaigns. He has not formally declared his candidacy. Al Taubenberger, now a City Council member, was the last longtime Republican nominated for mayor, losing to Michael Nutter in 2007. The Republican City Committee recruited Karen Brown, a Democratic committeewoman, as the candidate in 2011. Melissa Murray Bailey, a Democrat turned Republican, won the party’s endorsement in 2015. Staff writer Claudia Vargas contributed to this column.